Mangaluru, Feb 6, 2017: Prakash Amte, Magsaysay award winner, said on Thursday that it was essential to reduce inequalities in society. He was interacting with the students of Yakshagana Kendra, a constituent of Manipal University, here. The students of the Kendra presented the Yakshagana episode Jatayu Moksha on the occasion. Mr. Amte’s wife, Mandakini Amte, also a Magsaysay award winner, was also present. The Amte couple is engaged in social service in tribal areas of Maharashtra, including providing free healthcare and education to tribals. Mr. Amte said that it was essential that both the authorities and the naxalites had a dialogue as it was the only way out from the impasse. He and his wife had devoted themselves to the service of tribals, he said. 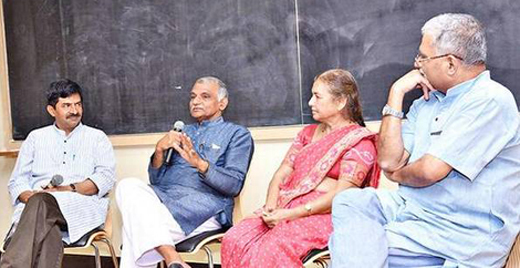 Inaugurating the fourth Gandhian and Peace Studies Course offered by the Gandhian and Peace Studies Centre, a constituent of Manipal University, and also interacting with the students in Manipal on Wednesday, Dr. Prakash Amte said that government should give priority to health and education of tribal people. If education and healthcare sectors were targeted by the government in tribal areas, the tribals would join the mainstream on their own, he said. But he and his volunteers told the tribals to bring those persons whom the ‘poojari’ could not treat. Hence, they got the first patient in a child, whom they successfully treated. The tribals then developed confidence in the clinic and started coming there. The clinic had since become a hospital, he said. The Lok Biradari Prakalp — A People’s Brotherhood Project, started by his father, late Baba Amte, also a Magsayay award winner, then started a residential school and an animal-care centre, Dr. Amte said. Varadesh Hiregange, director, Gandhian and Peace Studies, Jayaram Patil, theatre artiste, P.L.N. Rao, former Dean of Kasturba Medical College, were present.